Government’s plans for high-speed rail can help the UK meet its carbon emissions targets – particularly when the second phase to Manchester and Leeds is built. A report commissioned from Greengauge 21 by three prominent environmental organisations – the Campaign to Protect Rural England (CPRE), RSPB and the Campaign for Better Transport – sets out how HS2 can reduce carbon emissions. Operation of the first phase of HS2, a new line between London and the West Midlands, delivers carbon savings of 1.8 million tonnes of CO2 over sixty years, more than offsetting the impacts of constructing the line. But when HS2 is extended to Manchester and Leeds, the savings quadruple to over 7 million tonnes of CO2. “As HS2 is extended further north, the time savings and reliable high-quality services will attract more and more people out of cars and planes – and this is where the substantial carbon savings are to be made. 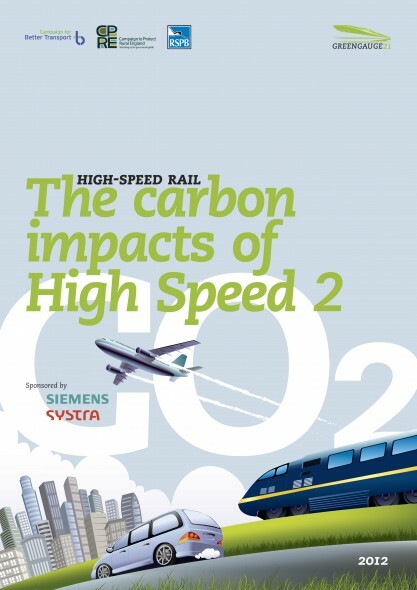 The report also highlights that greater carbon reductions can be achieved by sensible complementary policy measures and by making full use of the capacity that HS2 will release on the existing railway. These factors, highlighted in more detail in the report, should be taken into account when the cities on the HS2 network come to consider how to best exploit the advantages that the new line will bring, in order to deliver the maximum carbon savings.